GE Monogram, a branch of the GE family, has taken regular GE appliances to another level. Monogram appliances are built with impeccable craftsmanship and the latest in energy efficiency and design innovation. The Monogram series from GE is the high-performance line of appliances for the home. With the Monogram line, GE offers homeowners the ability to purchase some of the most cutting edge products around. Although the Monogram line is built to withstand a lot of use, appliances break. Action Appliance Repair can help get your Monogram appliance back in perfect condition. With over 50 years of experience, Action Appliance Repair is the service center you can trust with your GE products. Our staff is knowledgeable about the Monogram line and we’re experts at repairing your appliance and its specific needs. When our family-owned and operated business started in 1961 we were instantly committed to customer service. Now our clients return again and again for their service needs. We are proud of our ability to meet customer needs and give exceptional service. If your GE Monogram series appliance breaks or needs general maintenance then please call us toll free at 866-611-4479. 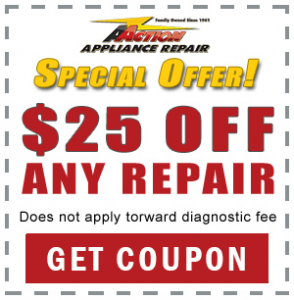 Here at Action Appliance Repair we make sure you get the best price and service in town. For this reason we provide your service call at no cost. When your GE Monogram series appliance needs repair then call Action Appliance Repair for work you can depend on. We are experts in GE Monogram appliances and can give peace of mind that your appliance is in the right hands. Our professional repair services and trusted staff are proud to offer a 5 year pro-rated parts warranty as well. So what does calling Action Appliance Repair for your GE Monogram appliance mean for you? We waive the fee of our service call if we repair your GE Monogram appliance. You won’t owe us anything if we visit and are able to repair your appliance.